Ever heard of salak, akebi, or Buddha’s hand? If not, you’re in a for a surprise. We’re unearthing some of the rarest and craziest-looking fruits you have to see to believe. 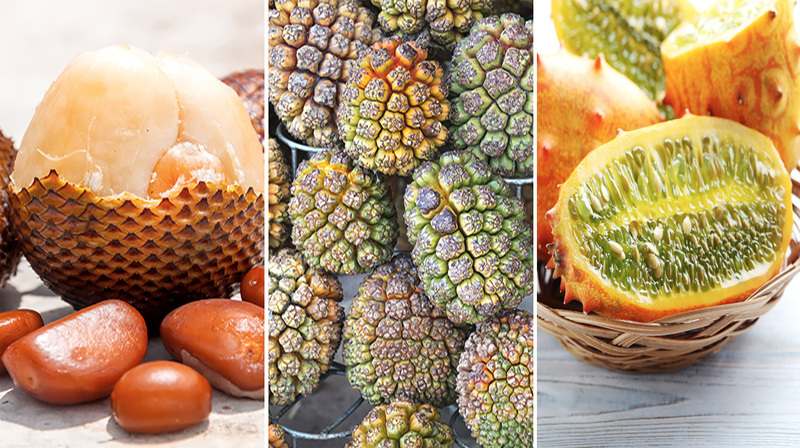 This spiky fruit gets bad press due to its potent stench, which is so foul that it’s banned from Singapore subways. But don’t judge this fruit by its cover: it’s also highly nutritious with a sweet and savory taste. Carambola is also called “star fruit” because of its shape when sliced. Sweet and slightly sour, it’s a good alternative to citrus and works well as a garnish. Remember: the brighter the skin, the sweeter the pick. Akebi is considered a culinary commodity since it’s only available during the first two weeks of fall. In Japan, many stuff, sauté, or deep fry the purple pod’s exterior, and use the translucent, pear-tasting interior to pickle cucumber. “Rambutan” translates to hairy in Malay, and one glance at its exterior will show you why. While sometimes compared to a lychee because of its similar appearance, rambutan’s sweet and sour interior actually tastes more like a grape. Buddha’s hand looks like a mutated lemon, but you can use it the same way. Break off a “finger” and grate it over baked goods, marinades, or salad dressings for a pinch of zest. The aroma is strong, so remember that a little goes a long way. A scaly shell covers the outside of “snake fruit.” But crack it open, and you’ll find three lobes that look like garlic cloves. Sweet like honey and tangy like a pineapple, this miniature fruit is an absolute flavor bomb. Similar to a pineapple, pandanus has sectional “keys” that produce a juicy nectar that can be sucked out or added to rice, meat, or fish for extra flavor. On the Marshall Islands, many also use the leaves to make grass skirts, mats, baskets, and natural dental floss. Jackfruit may be the largest tree fruit in the world, but that’s not the only thing that makes this mango-tasting delight special. It’s more often sold by the pound as an alternative to pulled pork. Kiwano’s spikey orange shell and slimy green interior give off an extraterrestrial vibe. While it tastes like a bland combination of cucumber, zucchini, and kiwi before it’s ripe, it becomes sweeter with age. Just cut the fruit in half and squeeze out its goo-covered seeds. Expand your palette beyond weird fruits, and try these dare-worthy delicacies from around the world.